Today is Lighthouse Day, created to commemorate the day in 1789 when US Congress approved an Act for the establishment and support of lighthouses, beacons, buoys and public piers. While this is a US commemoration, it’s surely reason enough to celebrate the important role fulfilled by lighthouses the world over, marking treacherous coastlines, hazardous shoals, reefs and safe entries to harbors. 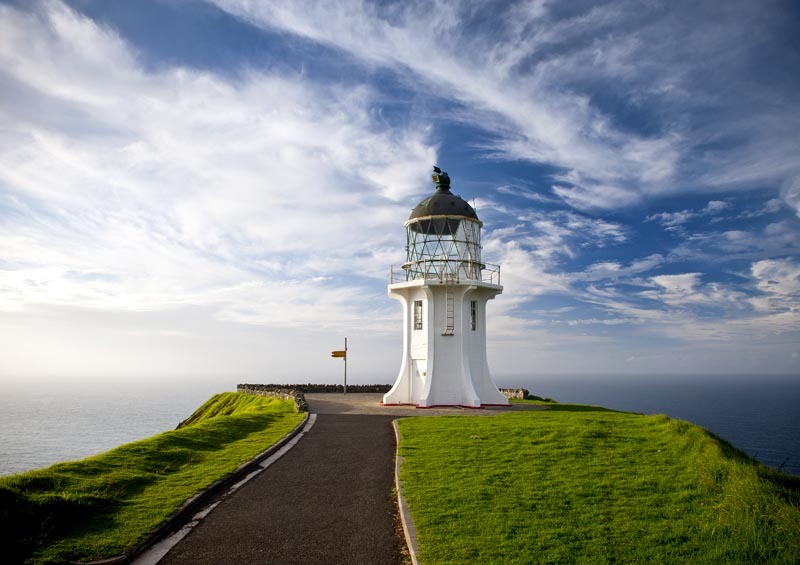 The Cape Reinga Lighthouse, situated in the Northland region of New Zealand, was built in 1941, replacing an older lighthouse dating back to 1879, that used to be situated on the nearby Motuopao Island. Initially a manned lighthouse, it was fully automated by 1987, and the lighthouse keeper staff were withdrawn. It has since been remotely monitored from Wellington. An interesting feature of the section of ocean that this lighthouse watches over, is that it marks the point where the Tasman Sea from the west meets the Pacific Ocean coming from the east. From the lighthouse, the line where the mighty waters clash is clearly visible, making it quite a special place. According to Māori legend this is the meeting place of the male Te Moana-a-Rehua, ‘the sea of Rehua’ with the female Te Tai-o-Whitirea, ‘the sea of Whitirea’, and also the place where the spirits of the dead descend to the underworld to return to their traditional homeland of Hawaiki. Many lighthouses have fallen into disuse due to high maintenance costs and the emergence of new electronic navigation systems. The aim of Lighthouse Day is to focus attention on these imposing landmarks from our past, and to create awareness about local, national and international societies and organisations making an effort to preserve lighthouses for future generations. Lighthouses traditionally symbolise safety, stability and truth, and as such their preservation holds symbolic importance for mankind. Go on, pay a visit to your nearest lighthouse and take time to appreciate its grandeur. And don’t forget to take some photos – lighthouses are famously photogenic entities! Love visiting lighthouses! I’d love to stay in one! Me too – aren’t they just the most wonderful places!? Absolutely! I know that you can book a stay in the lighthouse near Provincetown, MA.